Report By Peter Jackson Photos By Paul Mallard and Peter Jackson. Well the weather report was somewhat grim, but true to the tradition that if the event is advertised it will go ahead. There were six honest men turned up to do battle with the remnants of storm Brian. It still amazes me that such an easy to make model yacht copes with the most extreme conditions that would defeat most other classes. Yes there were some dire moments with a few pitch poles but most survived sixteen races. 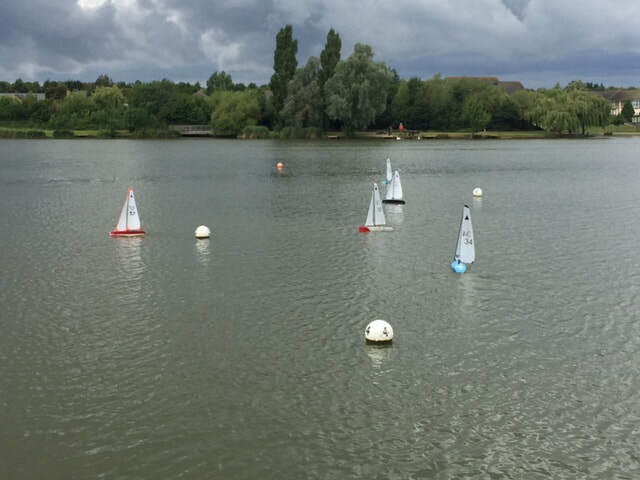 A good turnout of 13 skippers assembled at Emberton Park Sailing Club on September 9th for Round 7 of the Wee Nip Medal Competition. The wind initially was lighter than forecast and swirling from the SW, being affected by the trees and club house, which made course setting a little tricky. A straightforward triangle and sausage was eventually settled for, with an additional distinctive red warning buoy set on a patch of weed that had escaped the clutches of the "Emberton Queen" weed harvester. Unfortunately, before the race briefing could be given, a couple of over-enthusiastic skippers decided to give the course a try and assumed that the red was part of the course & inevitably had to be rescued. A few boats did fall victim to small pieces of floating weed in the first few races but as the event progressed the weed did not seem to be a significant issue. On the beat to the windward mark the position of the red buoy did give an interesting choice to skippers of either taking it to port and thus going closer to the bank with the risk of fluky wind , or to starboard with a wide beat towards the spit and then a long starboard beat to the windward mark. As the day progressed the wind picked up and shifted westerly to come directly down the lake, improving the beats and making sailing a bit easier. The position of the leeward mark also gave a challenging beat back to the finish line and places were frequently be gained or lost on this last leg. The sky became progressively gloomier after lunch and there were occasional viscous gusts coming down the lake. Thunder and lightning were observed and it was decided to call it a day after 15 races. Thankfully everyone (except Rob Bell in the safely boat!) was safely packed away and relaxing in the clubhouse before a heavy shower arrived. An enjoyable days sailing was had with the usual suspects competing for places at the front and a second distinctive group at the back. Unfortunately John Simmons had to miss the last two races so the result may have been even closer. Heading the latter group was Jeff Ford who was restarting his sailing after a sabbatical and who was giving a good account of himself with his first races with the borrowed "101". Race honours were taken (for the second time this year at Emberton ) by John Burgoine, followed closely by John Simmons, Keith Coxon and Peter Jackson. The Interclub prize was taken by Two Islands, followed in order by Abington Park, Hollowell and Emberton. The infamous "Murdoch" trophy was gratefully received by Geoff Raygada of Two Islands. Many thanks to all those participating and for the super assistance given by Bob Luddington and Dave Pace on the scoring/gate access and to Rob Bell for mark laying and occasional rescue duty. This years Wee Nip has really come down to the wire with four skippers still very much in contention for the series win along with another two with an outside chance. A lot now depends upon how the size of the fleet for the last event of the year at Hollowell SC on the 21st October, assuming the normal sized fleet (9-13), the anyone out of John Simmons, Geoff Raygada or Peter Shepherd could win with a race victory, however if John Burgoine was victorious and John Simmons managed only third then John Burgoine would be the winner. Needless to say the race team will have their calculators at the ready!Come along get involved enjoy the spectacle. Events in August always run the risk of poor attendance due to holidays and other family commitments and when this is combined with a weather forecast that promised floods of Biblical proportions, it was little surprise that we only managed to attract six skippers, four representing Abington Park and one each from two Islands and Emberton park. The weather forecast had moderated overnight and indeed we started in fair conditions, no rain and a nice westerly breeze, which meant that sailing from the spit was the option of choice. Keith bell set a very decent course , which included all points of sailing, often on the same leg, but that’s not unusual with a westerly wind blowing over the island and houses. Six boats started but an early boat failure for Tim Leese left him free to do the scoring, which under the circumstances wasn’t a particularly arduous task, with only five boats on the water. Racing at the front of the fleet was much closer than the results may show and it was pretty nip and tuck between Geoff, Keith and Peter with some very close finishes. Tom took a couple of wins in races five and seven but was not quite as consistent as the leading three. By about 11:30 the clouds had begin to roll in and the rains came albeit quite lightly. Having already completed nine races it was decided that it would be prudent to call an early lunch and battery change break, whilst we sheltered under the trees. As the rain petered out we resumed racing for another hour or so but by race fourteen the sky started to darken with distant rumbles of thunder. A well judged two more races saw us finished and packed away before the heavens opened whilst we worked out the scores in the dry of Pete’s car. In the end it was always going to be difficult for either Two Islands or Emberton Park to win, with one skipper per club, so the winning club this time was Abington Park, with Murdock going to third place man, Tom Steel. Reported and Pictures by Peter Jackson. The tWe assembled at Hollowell Sailing Club for the fifth round of the Wee Nip Medal Challenge, and we were gifted a rather pleasant day but with little wind from an awkward direction, that is from the south west. This made course setting somewhat difficult. Peter Shepherd set a reaching start to a port rounding windward buoy, and then a gate followed by an insure port rounding mark back to the gate then port round the insure mark and port round the initial windward mark to the finish. There were various gremlins during the day, most prominent was the radio problem found on Peter Shepherds boat, which resulted in him borrowing John Simmons. The irony was that PS went on to win over JS. Other things that were noted was an improvement in performance from Derek Lane, and a rather poor day from Peter Jackson, who was struggling with radio drop out at far distance, later traced to an aerial that had become unshipped from its proper place in the boat. The races took a little longer to complete during the day due to light winds and only fifteen races were completed.The Team prize was won yet again by Two Islands. 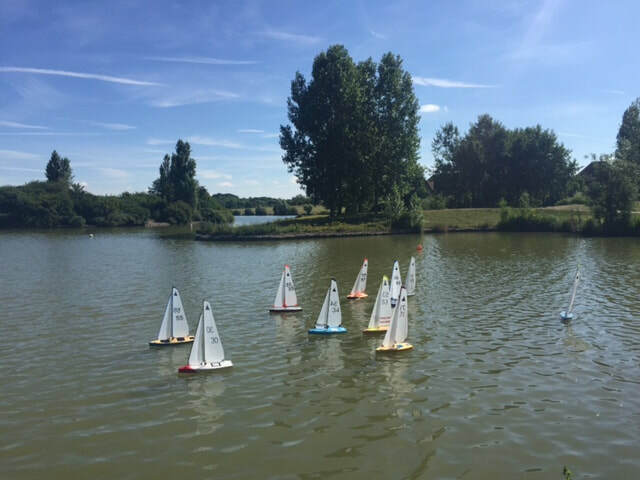 Saturday 8th July saw the Wee Nip challenge move on to Furzeton Lake , hosted by the two Islands RYC in what started off in perfect sailing conditions. As predicted, sun hats and shorts were to be the preferred attire, with the morning starting in clear blue skies with a lovely warm sun, which was to last all day. Just after 9:00 when we were looking to set a course, the wind was just as we had ordered it, a nice fresh breeze blowing across the lake from a North to North westerly direction, giving plenty of opportunities to set a decent course without resorting to shifting buoys around.By 10:00 am 11 skippers plus Mike Ewart, who had kindly offered to be race officer were ready for the off, but it was obvious to all that the initially perfect breeze had started to diminish somewhat.An initial port rounding triangle / sausage course, out into the middle of the lake was set and a practice race was run, which lasted around ten minutes.The wind was , as usual swinging a bit, so it was possible to make good gains or alternatively loose out heavily, but on the whole, the course seemed about right.After a couple of races of this course, with an ever decreasing breeze, Mike was forced to shorten the course, missing off the sausage portion.Although the length was now much better, it was felt that a slightly shorter course, which still included two upwind legs would be preferable, to allow for more tactical sailing. A slightly altered course was set, which more or less continued all day, with a minor shift of the windward mark, as the wind shifted in the afternoon.Wind , or lack of it featured all day, there being times that there was ample breeze for it only to drop as soon as the starter was powered up or as on several occasions to hold for most of the race , only to die as the fleet reached the windward buoy, leaving boats with no steerage to drift into each other and/ or the buoy. Even more annoying it dropped just after the leading pack rounded the weather mark, thus completely splitting the fleet into two.Despite the fickle wind, we had managed to run eight races by lunch time. Sadly at this time John Simmonds, who already had three wins under his belt, had to leave us for due to family commitments.As the afternoon progressed it was apparent that the leading pack of John Burgoine (Birmingham MYC ), Keith Coxon (Two Islands RYC) , Peter Shepherd (Abington Park MYC) and Geoff Raygada (Two Islands RYC) were beginning to ease ahead but it was John Burgoine ,adding to his morning’s excellent results to become the eventual winner. Always the bridesmaid but rarely the bride, saw Keith Coxon a very worthy runner up, with a very consistent set of results.A very close battle between Peter Shepherd and Geoff Raygada, was eventually settled in Geoff’s favor although an early non finish, after a collision turned Peter’s radio off may have altered the results.Keith Bell ( Abington Park ) was never far behind to just miss out on the podium. and challenging racing, with the inevitable wind shifts, typical of inland water sailing. manageable but certainly at the top end of comfortable. 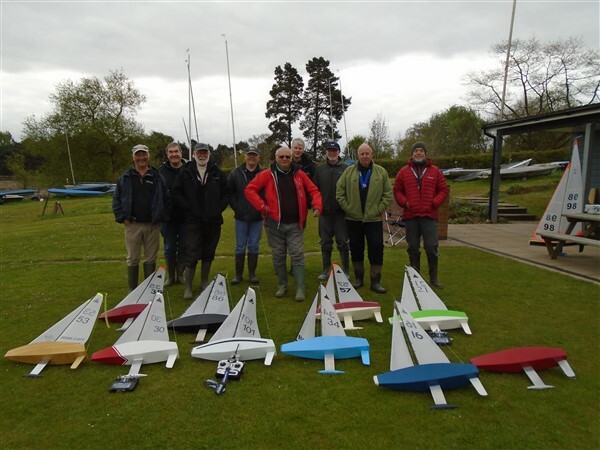 Ten stalwarts turned up to race their Wee Nips at Hollowell Sailing Club for the second round of the Medal Competitions. The wind as little as it was, was in the south with subtle shifts which most of the fleet had trouble identifying. However John Burgoine was the master of the day ahead of Paul Risdale. Special mention to Paul Mallard joining us from the Sailing Club, who is getting to grips with model sailing. The Interclub prize was won by Hollowell SC followed by Abington Park with Two Islands third, unfortunately there was a no show from Emberton Park. Many thanks to the 16 skippers who turned up at Emberton Park S.C. this month for the first of the 2017 Wee Nip Medal Series. Two of Emberton’s helms, unaccustomed to racing in such a large fleet, dipped their toes into the ‘big fleet’ waters and I hope were spurred on to travelling to another club’s water themselves. Having said that, the wind conditions were not good for maintaining full control of ones model, with a gusty westerly funnelling across the lake causing craft to frequently change tack with no discernible movement of the thumbs, ‘just like that’. Bob Luddington and Ash Shaw wisely withdrew their steeds from the event to fight another (hopefully more benign) day. Though this is not meant to be a knock-out competition, Keith Coxon besieged by a roller-coaster of medical setbacks maintained his upbeat demeanour but had to leave at lunchtime to keep yet another appointment. I am reminded of the nursery rhyme ‘Ten green bottles’, well not exactly, by lunch there were still 13 left standing on Emberton’s lake side preparing to do battle. And what a battle, at the half way point Simmons was one point ahead of Burgoine with the two Johns between them taking first place for 9 out of the 10 races. Half way point? I hear you question, well yes, this one was a marathon; Radio Sailing is now officially regarded as an addiction, everyone knew that their next race was going to be their best result, so we just kept on going. Dave Pace who had kindly volunteered to record the results was by 2:00 pm checking his watch with increasing regularity ( what time did the Rugby start Dave?) This happily coincided with race No 24 (a record I believe) so a good time to draw proceedings to a close. The final results, you can as usual read below. Prizes were presented by Emberton Park S.C.’s Commodore Rob Bell. 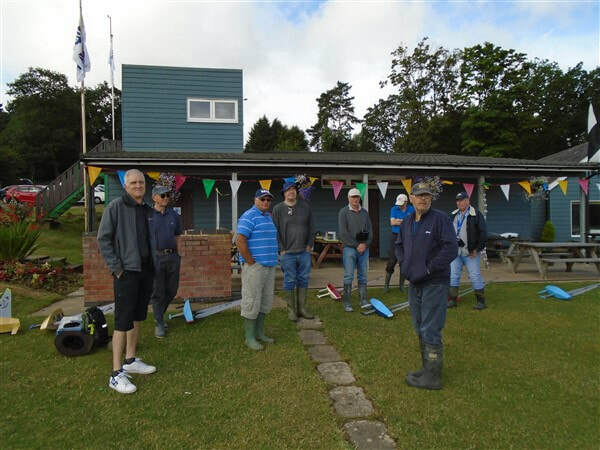 he efforts of John Simmons, Paul Risdale, Geoff Raygada & Keith Coxon of Two islands RYC were rewarded with victory in the newly instigated Inter Club competition, they were followed home respectively by Hollowell SC, Abington Park MYC & Emberton SC. Geoff Raygada was pleased to take home “Murdoch” on behalf of the winning club. He may not be much to look at but he does contain a heart of gold, I'll let you decide if that comment refers to Geoff or Murdoch! Thanks once again to John, John, Peter, Paul, Peter, Jeff, Mike, Rob, Colin, Derrek, Tom, Tim, Keith, Bob and Ash for making it a most enjoyable days sailing, and especially to Peter Shepherd for helping me produce the results for this 24 race epic.